Elearning has genies, superheroes, and wizards. Live training has the all-knowing instructor. I say all of them should stop being so darned helpful. Here’s why. Let’s say that you’ve dusted off your bike and have been riding it to work, but it’s no longer shifting smoothly and the chain keeps falling off. You tightened a nut that you thought might help, but the chain fell off again. Now what? Which of the following will make you a smarter biker? A. You download a troubleshooting guide from the internet. You spend two minutes going through its steps to check cable tension and the condition of the chain, and you discover that a loose Dunlowbrat was the problem. You tighten the Dunlowbrat and you’re ready to roll. Which is more efficient? Solution B, obviously. You didn’t waste two minutes checking other connections or puzzling things out. 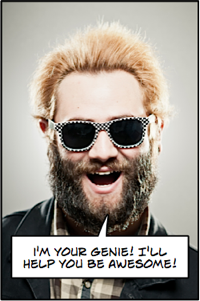 The hipster saved you time by telling you what to do. Which will make you a smarter biker? Solution A. When you went through the troubleshooting process, you learned that cable tension and chain condition can also cause problems, which will make future problem-solving go faster and give you a better understanding of how a bike works. You also might be more likely to remember a solution you discovered on your own rather than the one that someone with “superior knowledge” simply told you, although the trauma of having a hipster genie suddenly appear would certainly be memorable. What does this have to do with instructional design? Let’s turn your bike problem into an elearning activity with a clickable bike. Challenge: Your bike no longer shifts smoothly, and the chain keeps falling off. Click the part of the bike that is probably causing the problem. You click a likely-looking nut. You obediently click the Dunlowbrat and an animation makes it look like it’s tightening. Your dignity and your brain wither simultaneously. Let’s jettison the genie from our elearning version and see what happens. Challenge: Your bike no longer shifts smoothly, and the chain keeps falling off. Click the part of the bike that is probably causing the problem. If you’re not sure, follow this troubleshooting guide. You ignore the troubleshooting guide and click the wrong nut. Feedback: The chain falls off again as you’re climbing a hill, and you get grease on your clothes right before your meeting with the directors of HugelyImportant, Inc. Try the steps in this troubleshooting guide. You open the troubleshooting guide, which has you click on a bike part for each step and concisely explains why you’re checking each part. When you click the first part, you’re told that it feels tight already. The same happens for the second part. When you click the Dunlowbrat, you’re told it feels loose. You choose to tighten it, and you get the following feedback. Feedback: The bike shifts smoothly and the chain stays in place. You roll into work relaxed and grease-free. Obviously, in face-to-face training this would be a heck of a lot easier. Let’s say we have a bike-maintenance class in a parking lot. The instructor could bring out a bike that has a loose Dunlowbrat and have someone ride it around the parking lot while shifting. Everyone watches as the chain falls off. The rider also reports that shifting was rough. If you’re sure that your audience likes genies, superheroes, and wizards, you’ll probably want to keep using them. But I’d suggest that you encourage the genies to act more like the instructor in the face-to-face example above, helping people find the best solution, and don’t let them tell people what to do or how to think. You might also want to tell your genies to keep their feedback (“Awesome!”) in line with the level of learners’ accomplishment, unless you’re intentionally using over-the-top humor. Our hipster genie could actually be a fun, over-the-top guide, but only if he uses the techniques of the real-life instructor and helps us figure things out for ourselves. The main reason we add genies and their superpowered friends is because we’ve let the material be primarily a presentation, and we just want to make the presentation more “fun.” A deeper solution is to overhaul the design so there’s far less presentation and a lot more learning by doing. What do you think? Do you think genies can use their magical powers to deepen learning, or are they just another way to add bling to boring presentation? Let us know in the comments. Great post Cathy. The analogy really worked for me as I am an avid biker (and as a kid, a big fan of genies!). Totally agree with the principle of focussing on how to ‘diagnose a problem’ – rather than providing a ‘direct answer’ to the problem. It’s something we always try to guide our customers to do where possible, along with focusing on what learners need to do, rather that what they need to know. Looking forward to the next post! Another great post, Cathy. I like the example you use. Yes, providing guidance to solve a problem rather than tell the solution is the way we should design trainings. This reminds me of the application of game design strategies. Very good point Cathy. Thanks! It’s like… Feed, or teach how to grow/catch food: works for the mind too. Another great post. I think the push to make e-learning fun and interactive vs boring over the past years (coupled with certain popular ID theories) has created over the top presentation of content in more e-learning. The other question could be what is better, over the top or boring and flat? I agree, you have to find the right balance and more importantly, think of your audience. Doing by far is the best way to really gain working knowledge. Though the concept sounds easy, I know how difficult it can be to create such a product! I think it’s both. I think genies can use their magical powers to deepen learning, and they can add bling to a boring presentation. I agree with Christy that while the concept sounds simple enough it can be challenging and time consuming to build. What you are saying, however, is terrific! We need to get this concept in the hands of designers and I think teaching them how to build it using a current popular tool would have value. Thanks for sharing Cathy. You always have such helpful stuff!!!! I agree Christy, and will take that concept a bit further. I think seeking and learning is a great way to test knowledge and competency after a person has been taught the concepts in an interactive as possible format. Otherwise, why have e-learning? Just throw out a bunch of manuals and user guides. For example, in a healthcare scenario, I may need to teach a group of nurses how to use a new blood glucose monitor. Surely, I could link a copy of the manual in my course and give them a series of challenges to test their knowledge. I like that and would definitely look at that format to test their knowledge. But I honestly think they would learn better how to use the monitor to have my initial training include a visual overview of how the monitor works and perhaps include scenario-based knowledge checks in places when a concept needs to be reinforced. Once the initial training was completed, then the seek and evaluate course would have much more value. I agree with the push to make e-learning as unique, interactive and challenging as possible. But that becomes time-consuming and expensive. It can also become easy to overlook the very important need to teach the fundamentals. I know that I can teach how to use a blood glucose monitor better in an e-learning course than what is presented in the user manual. I believe there has to be balance. 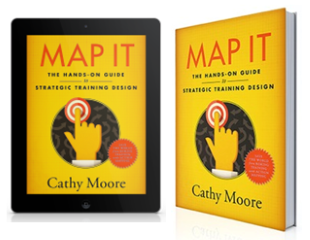 My one-two punch includes quality fundamental training, followed by the seek and discover Cathy Moore-inspired challenges. Great post as usual Cathy. I was kind of holding my breath reading your post bc we used a genie/coach figure recently and I was scared of what you would say about it. But we did something that I think is really cool. We used a coach with a heavy British accent and went over the top to be funny and we’ve had a great response so far. What I would like to do on our next round is shrink the role of the genie/coach and make it OPTIONAL. If someone wants to figure something out on their own, they can and/or choose to get the coach’s input. So if they’re more tentative and want to “ask an expert” first they can, or they can learn on their own and ignore the genie/coach. More choice = more power to the learner. Hi Cathy. I love reading your blog posts and consider your advice invaluable. In the world of big enterprise where time is money and the quality of employee training is often eroded by the demands of the business I read your posts to give me reinforcement in taking the right instructional design approach. I wanted to comment that I agree with your approach and when I use this kind of approach in my eLearning it always receives good feedback in user testing. However, it also takes time for learners to work through scenarios in this way and often learners are not afforded the time away from their work by the business. So in those situations do the genies remain or is there a way to help learners work through a series of scenarios without keeping them away from their work for too long? For example, call centre staff here only get 30 minutes a week for any kind of training (including eLearning and face to face content) from the entire organisation, not just my part of the business so competition for time with the learners is tight. Some people have expressed concerns about it taking too long or for other reasons being problematic to give people a troubleshooting guide or other (well designed!) reference and set them loose, and these are common concerns. I agree that it will probably take a little longer, but it also makes people think more deeply, and research suggests that people who learn this way are much better at transferring their knowledge to different situations (see my post “Throw them in the deep end” for that). I think there is a generational issue at stake here that is often missed. I worked at Jr. College for 4 years at the tech trainer to online faculty. There is a generation of learner out there (20-35ish) who are extremely prompt dependent. I’m not a sociologist so I will just stick to describing the behavior itself, but they do not extend themselves to answer questions. They would drag the bike over to the bike shop and pay the guy to fix it. They really don’t care about how to fix it because they just want to ride it. Internal locus of control learners will learn in any environment and web resources turn anyone with a will and a basic understanding of keywords into an auto-didact. But we can’t assume that type of learner on the other side of the monitor. What I taught my faculty to do was inverse scaffolding, much like we do in special education for life skills training. Full support with genies and cue cards at first, then slowly but surely turn them down and make them sparser and sparser until independent behavior is the norm. The learner won’t notice it and feel supported, they are set up for success, and the independent behavior happens anyway. Then the next time they encounter something, that prompt dependence has faded a bit and they are more willing to risk DIY learning. I agree that if we’re faced with learners who want to be spoon fed or have all their problems solved for them, we might have to adjust our approach *at first* to lead them toward independence, and slowly taking away scaffolding will help them. Hi Cathy! Wonderful post! Now I need to rework some of the lessons and feedback in my online advertising copywriting course! I am a cyclist, I ride to work. When my chain was slipping, I called up the bike mechanic I use and he talked me through what I had to do to fix it. I’m happy to have a genie/hero at the end of the phone who’s going to help me out, and if I had more money, I’d have just called him and asked him to do the job. Bike maintenance is of no interest to me. Recently I bought a small boat which has an outboard engine. I would have had it serviced professionally, but two things stopped me. It costs a lot, and I wanted to know how the main components work, so that if it breaks down, I might be able to do something about it. With the help of a couple of YouTube videos, a careful reading of the manual and about 8 hours, I had the job done. I was left with a sense of pride and achievement and the feeling that next year it will take half the time – great. So will I do the same with the bike? No, no way! I have a different relationship with the bike – it gets me around. The boat is for pleasure. I think a similar thing happens when we are involved in work-based learning. I recently learnt how to nest video clips in Adobe Premiere. It’s a useful technique and will help in certain work flows, but I know I’m not going to feel the same way about Display Screen Equipment training or a fire drill. eLearning is very often aimed at large groups. It’s not unusual for a course to be taken by 20,000 users. Some will be interested in the learning, others will just want to get it out of the way, and I don’t think it’s necessarily anything to do with materials being interesting or not. The bike and outboard tasks are very similar and so are the materials for learning how to carry out the tasks. I don’t think there’s a quick solution to this and we’ll never get it completely right. But, for me, a step in the right direction would be to move away from a ‘one size fits all’ approach and move more towards a ‘pick ‘n’ mix’ counter of learning opportunities. Fantastic post (as always). Within an hour of reading it, I found myself using the example with SME’s to convince them of taking the action-oriented approach to their courses 🙂 And then twice more for other projects during the next days. You rock, Cathy. I definitely agree that the best training is action-focused, exploratory training. I wish that I had the talent, resources and time to produce every course in this manner. However, I also believe that there are times when delivering more direct and less exploratory or action-oriented training is also acceptable and we need to learn how to do that well. For example, I learn an amazing amount when I read Cathy’s blogs or Michael Allen’s books. They include valuable information intended to be read with images, diagrams and examples scattered throughout that reinforce the concepts. If we placed these in an e-learning course, they would be page-turners. 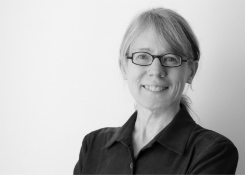 For Cathy to build an action-oriented, exploratory e-learning course for every concept she presented, the time involved would greatly limit what she could deliver. We might learn more and better, but we would have much less to appreciate. I think it’s import to know when these powerful courses are necessary and how to build them, but to also realize that some concepts can be delivered effectively in a more direct format. I believe we can still do that and make the courses effective. Lu, thanks for your comment. I agree that creating activity-driven materials takes more time, though as designers get used to the approach it becomes less time-consuming. It also becomes extremely important to focus our design on the high-priority behaviors and not try to cover everything. First, we need to make sure that the solution to the problem really requires the delivery of information (I’ve got a flowchart for that!). If information is part of the solution, we need to make sure that a simpler delivery mechanism wouldn’t be better, such as an improved job aid or a reference that people can use at the point of need. 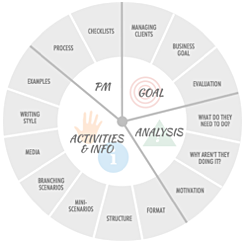 By avoiding unnecessary info delivery and delivering any truly necessary information in the most agile, useful format, we free up a lot of design time to focus on activities. And again, the activities we design should meet a real training need and focus on the high-priority behaviors that clearly need to change. Unfortunately, it’s extremely common for stakeholders to want a one-size-fits-all, shot-in-the-arm, track-it-through-the-LMS “course,” which means we designers are expected to put lipstick on a lot of pigs and have little time to design meaningful, challenging activities. 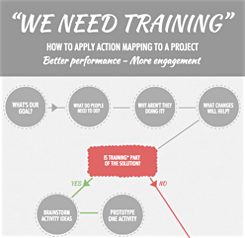 Action mapping and other tools in my blog are attempts to persuade designers to resist those expectations and find less “training”-like ways to deliver basic information. This is a long-winded way to say that my writing about activities assumes two things: (1) activity design is taking place after a needs analysis that included the stakeholders and (2) the activities address high-priority behaviors in which new perspectives or skills really have to be learned. My post “What to do if they just want awareness” addresses the very common “just tell them…” requests.